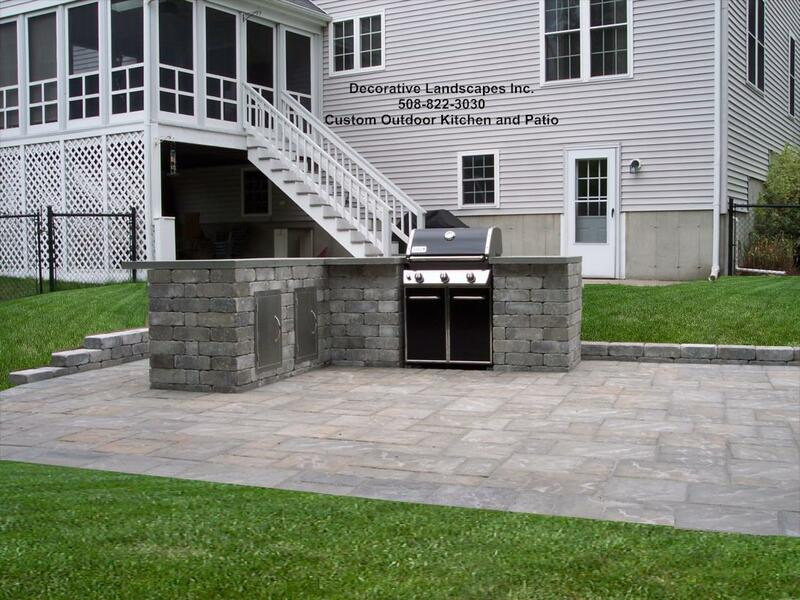 Patio Design MA, Patio Installer MA, Patio Construction MA, Outdoor Kitchen MA,Decorative Landscapes Inc.
Patios can provide you with the ultimate outdoor entertaining area or quaint family outdoor “recreation” room. An outdoor kitchen or bar area can add a whole new element of entertaining to your backyard space as well. To add some other interest to your outdoor room or backyard paradise you could add items like a water feature or a fire pit for the ultimate in relaxation. As in the case of walkways and walls, there are infinite possibilities for style, size, color and texture in the products that Decorative Landscapes Inc. offers to give you the ultimate in design flexibility. 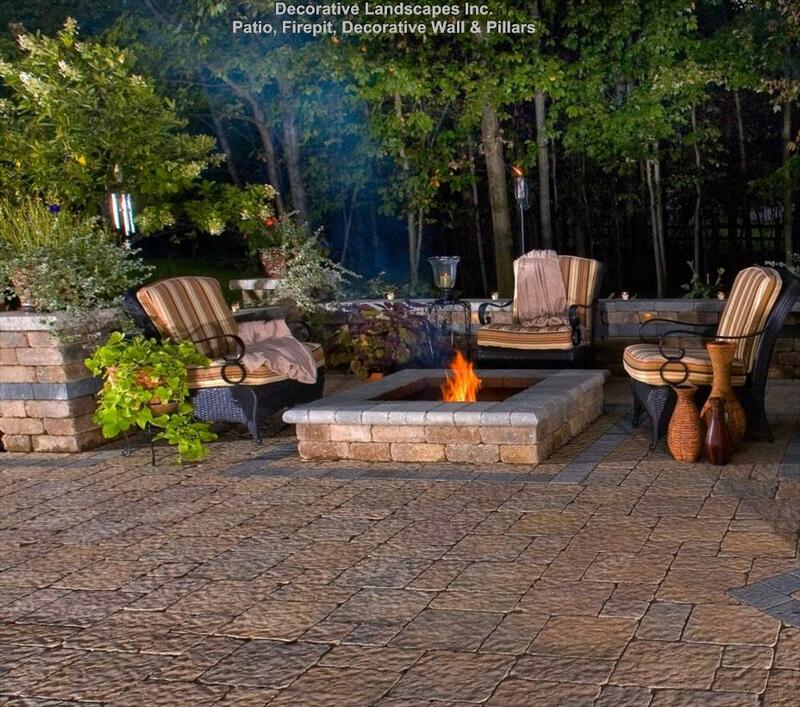 Some ideas for a patio would be Concrete Pavers, Bluestone, Sandstone, Fieldstone and traditional brick. You could always blend different stone types or colors for your own custom look. Let Kim design your patio or outdoor kitchen space with the perfect hardscape materials along with some plants to soften the landscape and you will not believe the transformation of your yard. You will feel like you are in a 5 STAR RESORT! For many years, people chose wooden decks for their patio surfaces, but inevitably over time the wood decays and requires a lot of maintenance and eventually a complete do over. 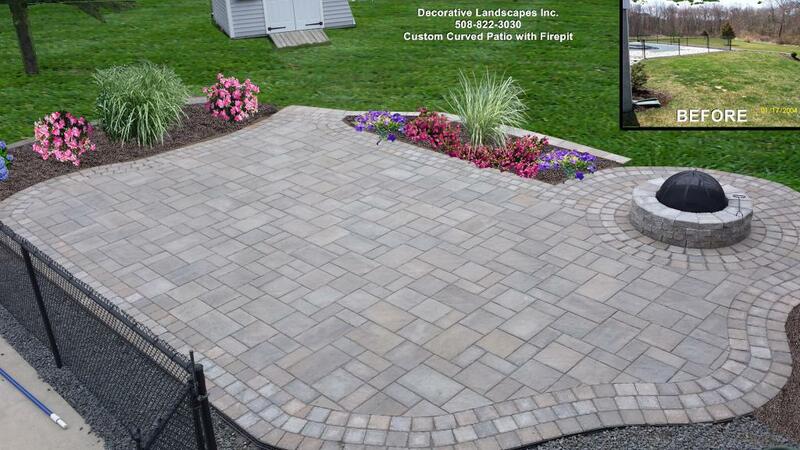 A stone or paver patio lasts forever and won’t need to be replaced down the road. Isn’t it worth the investment to do it right the first time without the worry of starting all over again? If you are looking for quality craftsmanship that will stand the test of time give Decorative Landscapes a call today to schedule your FREE Estimate or Landscape Design Consultation. Patios can also encompass different architectural elements. A patio can be a raised terrace based on terrain of your property. Also other features such as decorative walls, pillars and plantings can be added to enhance the beauty of your outdoor patio space.